Beautifully decorated, comfortable, large waterfront home overlooking the Jordan River and the Bay of St. Louis. This house has 5 bedrooms plus a dormitory style common room. Each bedroom has its own bath. The kitchen is very spacious, granite countertops and all stainless steel appliances fully equipped with anything you may need. Great living space with three sets of french doors leading out to surrounding porches that overlook the River. The main living floor has hardwood bamboo flooring throughout, and carpeting in bedrooms with a dining table that seats ten people comfortably. Lovely views and outdoor spaces. Small boat dock available. Newly added pool with heating option at an additional charge. My husband and I and family live in New Orleans but come to the Bay House whenever we can and whenever it is not in use. We built this property next to my husband's sister and brother-in-law, who called this spot "paradise". Where the Jordan River and Bay St. Louis meet. This is an outdoor lift for cargo only. Netflix, Amazon prime video, Hulu and cable. pool gear - floaties, etc. Great place for families! Everything was very clean and well organized. Owner is excellent with communication, too. We had a wonderful time and hope to come back again! 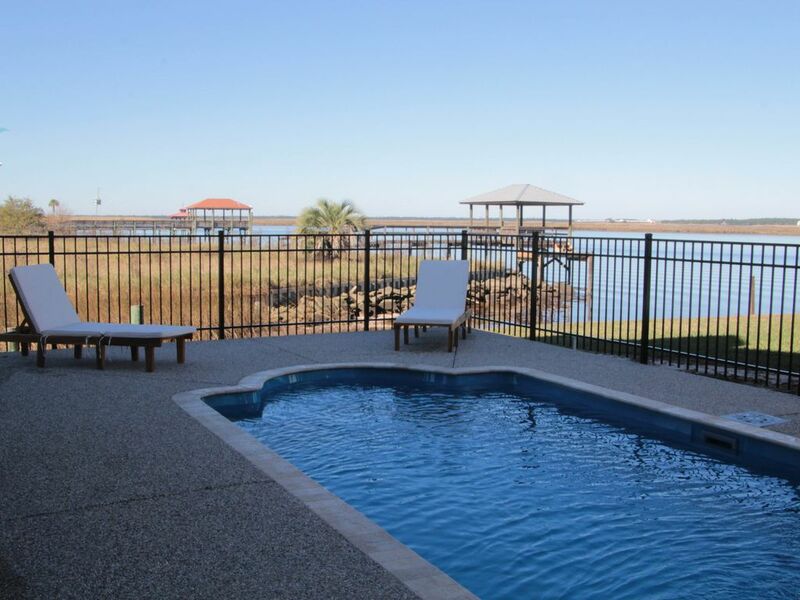 Beautiful well-furnished bayside home w every amenity we could wish for. One of the best getaways in the entire gulf coast region. If you enjoys being lazy, fishing, crabbing, playing games, watching movies, reading books, eating outisdie or inside, having your choice of a place to sleep. This is the place for you. My wife and 3 kids stayed 2 nights. The kids loved the fact that they could swim when it was still cold outside in the heated pool. We all fished and played games while my wife and I had a few glasses of wine at the outside bar. There were 2 small kayaks that you could cruise around the canal with or into the bay just close to shore because the are small and the current is swift. There are endless board games to play. Our kids went room to room finding the perfect room for them. There is literally something for everyone at this house. I enjoyed it so much I may have to move to the area. Again, I am so glad you all enjoyed the house and what it has to offer. We love it too and we're always glad to hear that others do too. Hope you will return. 7 women under 1 roof, we never felt crowded & we all agree this was a beautiful home that exceeded all expectations. Closely located to many attractions, easy access, beautiful view. Wendy, so glad you all enjoyed your stay and the house. Would love to have you and your friends back. I appreciate the fact that you left the place in great shape! We had a family Christmas getaway, what an amazing time at this wonderful home. I definitely go back again. The beds are fantastic. My nephew in law wants the info for the king bed upstairs. Ann was the perfect hostess!! The property was located on a quiet dead-end road, was spacious, well laid out, well equipped, and clean as a whistle. There were ample leisure/recreation opportunities on site and others not far away---including Gulf beaches, casinos, and excellent restaurants. The owner was not on site, but was immediately available when the few questions arose. Definitely a five-star experience that we plan to repeat in the future.